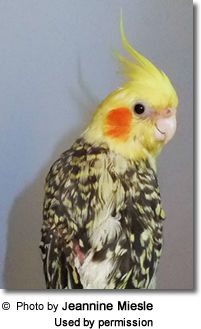 In the summer of 2010, I adopted a very ill cockatiel from an avian shelter. The bird had multiple health issues and was near death. After months of intense nursing, which included medications prescribed by my avian veterinarian, Dr. Robert Dahlhausen, most of the bird’s illnesses were resolved. The xanthomas, however, would prove to be more challenging. Benign growths consisting of lipid (fatty) cells and cholesterol. Firm, dimpled masses which generally form on the skin but may also form internally. Usually yellow but may be brown, reddish, or cream. Lesions showing light cells with foamy protoplasm (foam cells) under the microscope. Discrete masses often associated with hypothyroidism, Clostridium perfringens, clinical or sub-clinical illness, and a compromised immune system. Marked by the formation of Touton giant cells in the skin lesions. Usually benign; however, if left untreated, they could develop into cancerous growths. Growths which generally begin forming on one or both wing tips and progress toward the body. Masses which are often found on protruding parts of the body, such as abdominal hernias, tumors, or obese fat pads. Observed mainly in cockatiels, although other avian species may develop them as well. The result of a high-fat, high-calorie, all-seed diet high in sunflower seeds, safflower seeds, and peanuts. Indicative of an underlying metabolic disease in which the body is unable to eliminate excess lipids. Able to enlarge and spread quickly throughout the entire wing area and extend to the rest of the body. Capable of hemorrhage if the bird traumatizes the area. Masses which become thicker and surround the wing. The joints become involved and the wings droop. This inhibits the wing movements until the bird is incapable of flight. Masses which grow and damage the dermal tissue; the tissue eventually becomes ulcerated and Infection sets in. The capillaries become destroyed, and the bird experiences sudden bleeding episodes. These lead to massive hemorrhaging and eventual death. In this cockatiel, the xanthomatous tissue had invaded several areas on her neck, breast, sides near the wings, and upper back. They extended from the body, across the humerus bone, to the elbow joints and up the ulnar bones toward the manus (hand). The masses on the wings near the body had spread enough to restrict wing function. The xanthomatous tissue on her sides was an extension of those which covered her patagial (wing web) areas. These xanthomas covered most of the wing web and elbow joints, both ventrally and dorsally. Figure 1: June 30, 2010: Marcie’s xanthomas on her left wing, sides, elbow, and up into her neck region. Figure 2: The left underwing xanthomas. Note the necrotic lesions under the wing and xanthomatous tissue on her axial areas (sides). The xanthomas are visible as they grow through the feathers. Marcie’s condition was critical. 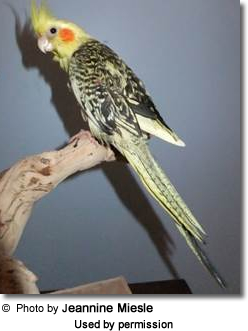 Dr. Dahlhausen administered and prescribed multiple medications for her concurrent diseases and provided Gentamicin Sulfate antibiotic cream for the necrotic sores and dermal infection under her wings. I was to massage the cream into the wounds several times a day. Since the masses were interwoven with the damaged tissues, all of the affected tissues received massage at each session. Excision of the masses if they are not too large or involved. If the condition occurs as a discrete mass and not as the diffuse type, excision of the mass alone with some of the immediate surrounding tissue is possible. Amputation of the wing tips containing the xanthomas. Amputation of the entire wing in severe cases. I rejected all three of these options, resolving to devise a method of eliminating these masses by non-surgical means since she could not have survived surgery. Even if she could have survived it, I refused to subject her to it. According to Dr. Dahlhausen, since xanthomas are composed of lipids and cholesterol, the fats would be reabsorbed into the body and eliminated, but the cholesterol would not. The yellow masses would shrink a little as the fat dissolved, but the cholesterol--filled cells would always be with her, enlarging and spreading. I reasoned, therefore, that the xanthomas should respond to therapeutic, restorative massage. The cells would undergo lysis (cellular breakdown) if exposed to pressure and manipulation. The friction and resultant heat created by massage would become the lysins that would destroy the fat and cholesterol cells’ membranes and thus destroy the tissue. The blood would absorb the cholesterol, and the body would then excrete it as it does the lipids, through the intestinal tract. It was plausible, therefore, that the xanthomas would reduce in size and eventually disappear. I began to massage the xanthomas at the same time as I worked on the sores. During the next few weeks, the wounds began to heal, but the xanthomas were unyielding. At her visit in late August, Dr. Dahlhausen did notice a slight decrease in the size of the xanthomas under her wings but not on her elbow joints, neck and back. I was taken aback by an unusual occurrence: The yellow masses seemed to decrease in one area and increase in another, as though the cells had moved. At this time, it defied explanation. Figure 3: July 3, 2010--Note the xanthomatous growth on the right patagium (wing web), above the elbow, and the xanthomatous tissue on and below the neck. The xanthomas on her muscles and tendons are visible, as is the xanthomatous tissue extending up the wing from the elbow to the manus, or hand, joint. Figure 4: Aug. 20, 2010--Marcie's left underwing, showing the growth pattern of the xanthomas; they are attached to the muscles, tendons and bones and are inhibiting her wing movement. 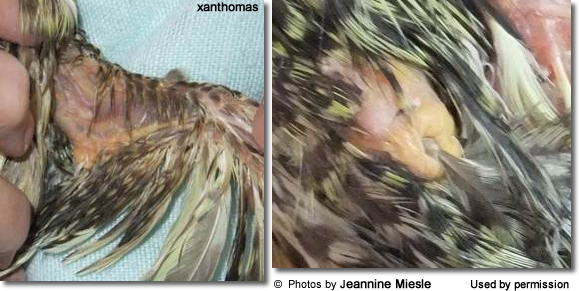 Figure 5: Sept 15, 2010—By September, we were beginning to notice some improvement in the lesions under her wings and a reduction in the size of some of the xanthomas. The xanthomas wrapping around the elbow joints are visible. Figure 6: Nov 16, 2010—The left underwing; note the reduced size of the xanthoma at the elbow joint. Work a small amount of Gentamicin antibiotic cream into the xanthomas and any other necrotic or damaged tissue. Manipulate the xanthoma between thumb and forefinger, squeezing the tissue gently and working it with the fingers. Alternate squeezing it gently with manipulating it back and forth and massaging the top of the tissue in a circular motion. The tissue will then become soft and pliable, and the cholesterol-based top layers will peel off easily. This oily tissue will break down as you work with it and feel greasy to the fingertips. This may take weeks to begin taking place, so don’t give up. When the tissue feels greasy and moist, blot it away with a small amount of Domeboro on cotton balls. This may need to be done several times during the session. The tissue eventually will become friable, hard, and crusty, flaking off as you work the growths. The tissue lysis, or breakdown, is now occurring. After the massage session is completed, cleanse once more and work in a small amount of Gentamicin cream; this stimulates the xanthomatous tissue in preparation for the next day’s work. The cream plays a key role in the healing process of the tissue; therefore, it is essential that the tissue stay clean and free of any bacteria so that the cream can work. Perform the massage at least two or three times a day. Make the sessions brief—only a minute or two at a time—depending on the bird’s ability to tolerate the manipulation. The body is extremely stressed in its attempts to heal concurrent illnesses. The life-threatening, internal diseases and external wounds are dealt with first, and the rest wait. Therefore, it took weeks for the xanthomas to respond to treatment. Since her body was also immune-compromised and suffering from poor nutrition, results took even longer. Figure 7: Nov. 16, 2010—The xanthomas stretching across the bones and muscles of the right wing are shrinking, and the wing is able to extend more fully. There is a clustering of xanthomatous tissue developing above and to the right of the elbow joint. Figure 8: Dec. 5, 2010--The masses on her left elbow, ulna and side are shrinking. The lipids had been absorbed, and all that remained were the cholesterol layers, now converting to friable, brittle, crusty deposits. The skin covering the xanthomas had shrunk so much that the globs of yellow-orange, dimpled xanthomatous matter were embedded in the tissues. One xanthoma was suspending from the underside of the right wing. The epidermis on her back and around the xanthomas was peeling off, layer by layer, exposing the delicate tissue underneath. Her body was shedding the dead skin and replacing it with new layers of tissue. The manipulation caused some redness and irritation in the highly vascular and fragile tissue. At the lower section of the xanthomas, on the elbow joints, new feathers were attempting to emerge through the xanthomas. This irritated her, and she would pick at the xanthomas to relieve the discomfort, causing them to bleed. The inflammation was reduced, and her skin became softer as a result of her frequent cream applications and massage. After the sessions, she exhibited improved well-being and increased energy levels for a brief time. By January of 2011, the xanthomas were showing visible improvement. They had been steadily shrinking due to the daily massage. The appearance of the knot-like protrusion seen in Figures 13 had yet to be explained. The previously large, spreading xanthomatous mass appeared to be condensing and accumulating in that one area near her body. This tissue concentration would be clarified later in her recovery as it tied into the final dissolution and excretion of the xanthomatous cells. Figure 9: Dec. 5, 2010—Feathers are trying to break through the xanthomas on her elbow joints. Figure 10: Dec. 20, 1020--The right wing, showing xanthomatous tissue in the wing web. She is unable to achieve full wing extension due to the xanthoma from her elbow attaching to her side. Figure 11: Dec. 26, 2010—Marcie’s left underwing xanthomas are shrinking; the ulna still harbors some xanthomatous tissue. There is one small cluster above and to the left of the elbow. Figure 12: Jan. 30, 2011—Marcie’s right underwing still shows the yellow, webbed, intricately involved xanthoma where the wing meets the body. This would undergo significant changes. Figure 13: Jan. 30, 2011—The xanthoma on her left elbow joint has shrunk a little but is still a large mass. Figure 14: January, 2011—On the dorsal, left wing elbow joint, the xanthoma has shrunk and now only covers the lower half of the joint. It is the lower, yellowish, dimpled part, where the feather is coming through. The pink area above it is bone and skin tissue. Any feathers that attempted to emerge there eventually fell out as the xanthoma reduced in size. Figure 15: March 14, 2011: Marcie’s right underwing showing dark feathers emerging from the xanthoma on the elbow joint. This complex xanthoma is wrapping around the bone and interconnecting musclse and tendons. A knot-like cluster of xanthomatous matter is visible above the black feathers, attaching to her body. It is inhibiting wing movement. Figure 16: March 14, 2011--The left underwing skin is showing rapid regeneration as the xanthoma gives way to healthy tissue on the patagium and over the bones. There are visible cracks in the wing web (above the ulnar bone) that would take time to heal. In April, a clear, yellowish, heavy fluid had begun seeping through the skin under her right wing and side. I believed that this sticky fluid must be cholesterol, and it was undergoing lysis, breaking down and converting to a liquid. Only the right underwing and the skin around her neck now bore the xanthomatous tissue. These areas might have been the source of this viscous substance, but it was oozing out from the inside of the body through the skin instead of being absorbed into the body and excreted through the intestinal system as the lipids had. 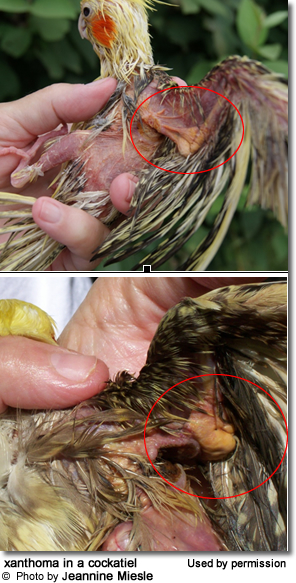 In addition, the tissue under that exudate on the wing was not healing. Dr. Dahlhausen had originally projected that this condition would have run its course in a few weeks. He agreed that it was most probably the cholesterol undergoing lysis, and that the massaging had broken down the molecules of cholesterol so that the body could eliminate them. I presumed that it was possible for the cholesterol to break down within the dermal layers and escape from the body through the patagium, but we could not explain this phenomenon. Dr. Dahlhausen ran a cytology test on the right underwing tissue from several locations. There were no fungal cells, so the sticky exudate could only be coming from the cellular lysis in the xanthomatous tissues. If indeed the ginseng were to work, it could take months, since the natural remedies do not show results quickly; but, in the long run, they are often the most effective when medications fail. I began to put a few drops of the dark liquid in with her Emeraid. The body was rejecting it; therefore, the seepage needed to continue until all the cholesterol remaining inside her aortic arch and within her dermal tissue had been expelled from the body. If her body did not expel the cholesterol, it would continue to build up around her heart and on her skin, creating more xanthomas. Therefore, the flow must cease on its own. The ginseng played a part in stimulating the body to continue releasing the cholesterol from the tissues and blood. After two weeks of monitoring the discharge of the cholesterol, I observed the size of the xanthomas gradually decrease. If indeed the ginseng had worked to assist in eliminating the cholesterol from her aortic arch, was her body now completely free of cholesterol? How could we tell if it were? 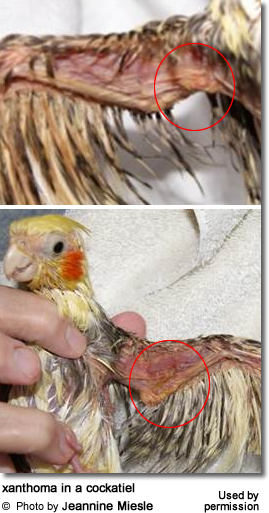 Figure 17, 18: Dec. 2011: All of the xanthomatous tissue is gone from Marcie’s wings and sides. The tissue has healed and feathers are growing in. The ginseng had pulled all the cholesterol out of the aortic arch and any dermal tissue which had not responded to massage. The ginseng was the missing, essential component that her body has been calling for to resolve the xanthomatosis since it worked from the inside out. The external massage could not have accomplished this. The combination of ginseng, massage, Gentamicin cream, Emeraid supplement, and good nutrition enabled her body to eliminate the cholesterol deposits through the skin. Each component was necessary. The xanthomatous masses had shrunk into globules and condensed near the body because, after the lipid deposits had been eliminated from the tissue, these yellow cells were all that remained of the xanthomas. The ginseng pulled the xanthomatous cells to one location and then completed the cellular lysis. It is essential that the oily exudate be cleansed during and after each session as the cholesterol dissolved. If left on the xanthomatous tissue, it would have lubricated the tissue so much that friction would not have occurred, thus minimizing the effect of the massage. With further massage on the dry tissue, the xanthomas had been stimulated to exude more cholesterol. Figure 19 and 20: December, 2011: The Xanthomas on Marcie’s elbow joints are gone, and the covert feathers are growing in over the joints. I believe that the removal of xanthomas can be accomplished on any bird, regardless of the extent of the xanthomatosis. I am unsure about whether I would have achieved the same results had I used a different antibiotic cream or a non-antibiotic cream. In this case, however, the antibiotic cream was necessary because of the extant dermatological infections and open wounds. It took six months for the xanthomas on her wings and elbows to resolve, and another six months to eliminate them from the skin around her neck, upper back and throat areas since I was unable to manipulate that tissue. But it was more than worth the time spent in order to avoid surgery on her. Time, commitment, and patience. The reader will find the complete article on Marcie’s rescue and recovery at this website: www.beautyofbirds.com/marcie.html.